This week I am playing with Simon Says Stamps' March Card Kit. It's GORGEOUS. If you like colour, this is the kit for you. My card today features just the adorable rainbow stencil and some of the stamps (both also available separately). It is a super CAS card, but was pretty fiddly to make. But I thought it was worth the effort to get that gorgeous glittery rainbow. To make my rainbow, I first adhered the stencil to white card with some washi tape, then added some Translucent Embosasing Paste. When the paste was dry, I applied Glossy Accents very carefully over the paste, before adding some Doodlebug fine glitter - one rainbow colour at a time. I adore rainbow cards, and I adore glitter! Yay. Back soon with more cards created with this gorgeous kit. 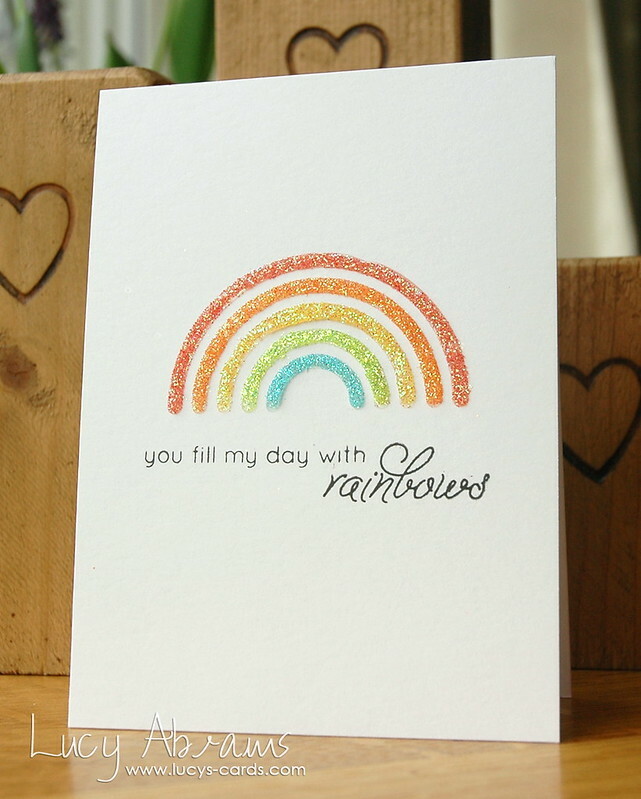 Gorgeous card - I love rainbows too! Super fun and happy card! Love the glitter! Love your glittery rainbow Lucy! Gorgeous card with just the right amount of glitter, stunning! Yum that card is just perfect. I love rainbows and rainbow colours and I love glitter so its my perfect card. I absolutely LOVE your glittery rainbow! Definitely worth the effort you put into it!!! 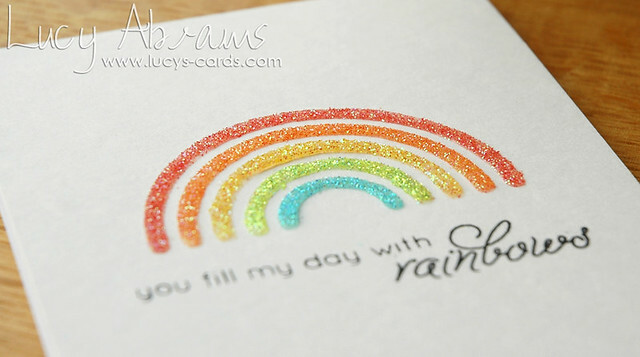 Your glittery rainbow is so cool - love the effect that you have created! I just love this CAS design. LOVE your glittery rainbow! So pretty!